Data drives the Industrial Internet of Things. As production demands increase, factories are turning to real-time data to make smarter decisions. What if your devices could tell you what they are doing, how well they are doing, and instantly alert you to problems? Get more out of your devices by gaining control and insight into your sensors with IO-Link solutions from Banner. IO-Link is an open-standard serial communication protocol that unlocks valuable data from sensors and other devices. One. Connect. 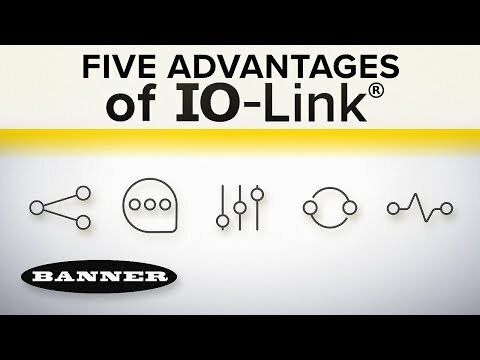 Banner’s IO-Link devices are connected by cost-effective, standard cables with universal connectors. This reduces the variety of interfaces for a sensor, which saves inventory costs. Two. Communicate. IO-Link gives you access to operational and performance metrics for your devices. Smart sensors with IO-Link let you remotely access sensor readings and see how well the sensor is doing. With real-time diagnostics, operators can be alerted in advance that a sensor needs cleaning before it fails. Three. Control. Remote configuration and monitoring allow you to dynamically control devices. Easily switch between device parameters to speed up product changeover and accommodate a greater variety of products. Four. Replace. When you need to replace a sensor, simply swap it out with a new one and let IO-Link automatically import prior settings. This helps get your line back up and running as quickly as possible. Five. Predict. With IO-Link, anticipate problems before they escalate. Real-time sensor data makes troubleshooting simple, and historical data helps you predict and prevent future downtime. Optimize your operations, get more from your devices, and make better, data-driven decisions with IO-Link solutions from Banner.